Last month Dave and I sat down and blindly tasted three Imperial IPAs. At that sitting, we preferred Hopworks Ace of Spades, followed by Pyramid Outburst, with a possibly decrepit bottle of Ninkasi Tricerahops lagging behind. On that post, Jeff Alworth commented that he wished Deschutes Hop Henge had been in the competition. Hop Henge is something of a moving target, since every batch is a different experiment on the recipe, but it is right in there with the hoppiest, maltiest bruisers, so I hinted that I might try a second round of IIPA tasting, pitting Ace of Spades against Hop Henge and another beer I'm a huge fan of: Firestone Walker Double Jack. Suprisingly, I did get my act together enough to pull that tasting off at a neighborhood get-together last weekend. There's a kind of poker poetry there -- a pair of jacks beats ace high. I'm not sure what kind of hand a henge is. The three gents were unanimous in ranking the beers that way; Gypsy agreed the Double Jack was best, but didn't care for the Ace of Spades, so Hop Henge was her second-place vote. Of course, we didn't know which beer was which when we ranked them, though as part of the fun Lindsey, Dave, and I tried to guess their identities. Dave got all three of them right; Lindsey and I got Hop Henge right but incorrectly guessed that the #1 brew was Ace of Spades -- which surprised me until I found out the truth, since I had expected to like Double Jack the best, as indeed was the case. We almost oppressed Dave into joining our side, but he stuck to his guns and won the guessing game. All three are worthy, if you like giant hop monsters like that, and Ace of Spades and Double Jack have enough in common that you might mistake one for the other. Definitely try the Double Jack if you haven't already. 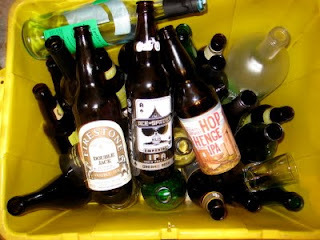 But check this out: the blog Bottle Battle blind-tasted Double Jack vs. Widmer Deadlift (now called Nelson IIPA), and the Widmer won. I've written favorably about Deadlift/Nelson in the past, but I can't imagine it beating the magnificent Double Jack, so I may have to do yet another round of blind IIPA tasting to see for myself. You and I are in some kind of strange synchronization. Last night I had a Hop Henge. I will admit to finding it less than transcendent, as last year's edition was. That's one of the virtues, but obviously, it means there will be peaks and valleys. They get credit for having the best label, though! Look forward to seeing how you rate the Nelson (formerly Deadlift, which I think is a far superior name). That beer blows me away every time. I think it's severely underrated when compared to some of the big IIPAs coming from breweries with more hype. @Jeff: I dunno, that Ace of Spades bottle is pretty slick, hidden watermark and all. Hop Henge is a moving target, but the current versions don't seem to be the best. Dave said he hated the last one he had at the pub (in fairness, I had one last week that was just fine). @Gibson: I am going to try Nelson again soon. Funny, people don't seem to like the new name, but jeeze Louise, Deadlift isn't a very good name either. Yeah, Deadlift isn't great either, but Nelson just reminds me of the bully on The Simpsons. "HA! HA!" Yeah, I like the "Ace" label, too, but the name and design of Hop Henge is inspired. I love the Ace of Spades compared to the others. I thought the best Hop Henge was the first.. when they had the big blow out... Double Jack for me is overrated and a malt bomb. Port Brewing Mondo is one to try. I thought Widmers Nelson was quite good, and did seem better to me than when I tried Deadlift at its first release. I also took a liking to Alameda's Yellow Wolf. Very solid and hoppy.